Oh my gosh you guys. I hit the jackpot. First off, I met a wonderful woman, Heather, who has become a dear friend, AND I hit the jackpot with this recipe of hers I am going to share with you! Foodies just find each other. I have met so many wonderful people in the last 1.5 years through blogging. I am so blessed, really I am. These women and men have become great friends and I hope one day we will all meet "in the flesh". Until then I will cherish and nurture our friendships over the computer!! I started watching Heather's YouTube channel a long time ago, I had left her a few comments here and there and when I found out she had a Facebook page, I was thrilled. Heather is my kinda lady, just an everyday mom, and wife, who loves her family, lives her life as best she can, and has a heart of gold. We became fast friends and I couldn't be happier!! I have been scopin' out her goods, errr....recipes rather, and came across these Peanut Butter Blondies. Now blondies are my husbands favorite!! So, I gathered my ingredients, I baked these beauties, and guess what. The dog ate them. I swear, with God as my witness, I almost DIED!! So, then I learned I was going to be receiving the Pampered Chef Brownie Pan. WELL, I HAD to wait to get that to remake them! I got it, I got it, I GOT IT! I LOVE this thing unlike I have ever loved any other inanimate object! I followed the recipe exact last time, but this time I chose to omit ONE item. I will tell you when we get there. So if you would like to watch Heather and (infamous) Toby, her hubby who is her camera man and taste tester extraordinaire, you can find her videos here at Heatherzblueyez1974. You can find her at her blog MishMawsh And Other Things. You can LIKE her on Facebook Heatherrzblueyez1975 OR Twitter at HeatherzKitchen. You will find her easy to relate to and easy to hang out with. Her recipes are delicious, great everyday food, for families, things kids will eat and adults too!! 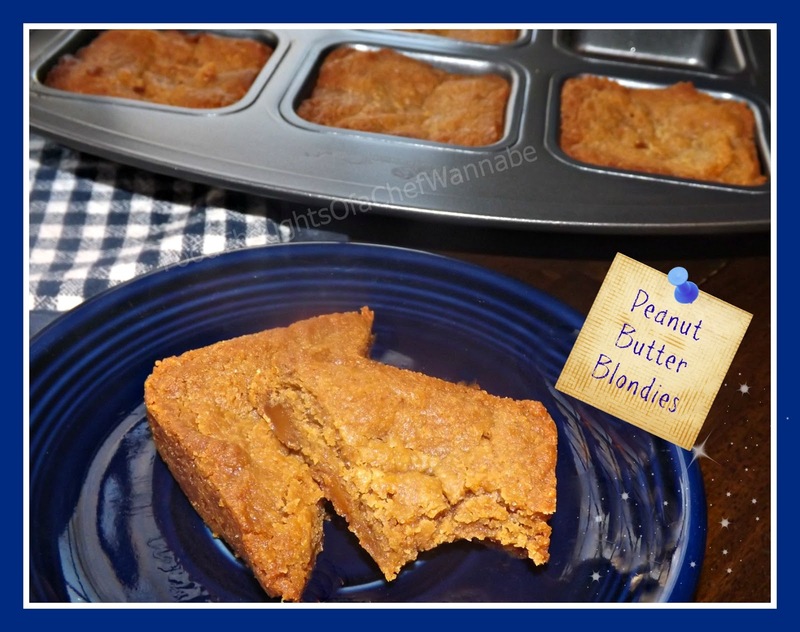 Here is what you will need for her recipe for Peanut Butter Blondies! DO NOT skip adding the caramel chips. They add the most incredible chewy texture and flavor. LAWDY I love these! OK, anyway, preheat your oven to 350. Now, I used my PC Brownie Pan but you can also use an 8x8 or 9x9 pan. Get them sprayed with nonstick cooking spray and set aside. Cream, butter, sugar and peanut butter together. Add in your egg, vanilla, baking soda, and baking powder. Mix in your flour and then fold in your chips. This will make 12 brownies in the brownie pan or a regular square pan of brownies as mentioned above. Bake for 20-30 minutes if baking a regular pan. Bake 22-25 minutes if making them in the brownie pan. A toothpick inserted might come out a little moist but no batter, they are DONE at at that point. As they cool and carry over cook, they become chewy perfection! Did I mention NOT skipping the caramel chips?! OK, good. Let cool COMPLETELY before cutting and serving! I mixed mine a bit different because I am an impatient woman who wants to throw everything in a bowl at once and have it turn out perfectly! Here is a link to the original post... Peanut Butter Blondies. Enjoy these babies, we sure did! !